Rebounding Skills: JUST A FEW HEADLINES FOR ALL TO SEE AND ASK OURSELVES: IS THIS WHY GOD HAS HAD ENOUGH? Suppose you get home from grocery shopping and discover your six-year-old is eating candy you didn’t buy. It might be tempting to just scold him, send him to his room, and let it go at that. After all, it’s only worth a dollar, and you’re tired. But you’d miss an opportunity to turn this “miss” into a second chance(JOHN 3:16). JUST A FEW HEADLINES TO ASK OURSELVES: IS THIS WHY GOD HAS HAD ENOUGH? Search for answers begins after US school massacre/School shooting triggers ‘mind battle’ for Columbine victims/After shootings, schools and parents ask: Is there any way to be safer?/Trauma of Connecticut school shooting will linger a long time/Muslims Riot, Jews Banned from Temple Mount/Op-Ed: Northeastern Students Call for Murder of Jews/IDF Soldiers Foil Firebomb Attack in Hevron/Bleach Attack on Advocate for Jewish Victims of Sexual Abuse/’Queen James Bible'” Now There’s A Gay-Friendly Version of Scripture/Atheitsts Rent Billborad in Times Square To Dub Jesus a ‘Myth’…/British Census: Islam Fastest-Growing Faith in England; Christians / Police cars and ambulances arrive at a Alabama school after a fight during a basketball game….. Though the bad news is devastating—that we are, in our sinful nature, contrary to God’s character and out of line with His foundation of wisdom—the good news is that we can change. Wisdom does not remain forever elusive, no matter how firmly we have rejected it in the past. The wisdom of God will lead us to the cross of Jesus, of course. That is where all of our former futility is redeemed and our rebellion forgiven. A humble bow before the sacrificial Lamb will cleanse us of the muck of this world and put us on a path of discipleship. But once we have passed through that Cross, we must cultivate our love for the eternal. We must pursue wisdom with a passion. We must become enamored with the righteous ways of the world as it was meant to be. If you are ever lacking in perspective, read the first two and the last two chapters of the Bible. Genesis 1-2 and Revelation 21-22 are pictures of perfection. From paradise to paradise, from the Garden of Eden to the city of God, from the dust of the earth to the bride of Christ, wisdom rules. Take away the huge parentheses on the sin problem—Genesis 3 through Revelation 20—and you’ll clearly see the holiness of God and the beauty of His handiwork. It’s often hard, in this parenthetical interim, to see such beauty, but it’s there. It’s our origin and our destiny, all rolled into one. As you read those four chapters, the eternal bookends on either side of the temporal sin-problem, let your love grow deep for your Creator and Redeemer. As a plant stretches toward the sunlight, let your life grow toward His wisdom. Open up before Him, and let yourself love His ways. 1“All this I have told you so that you will not go astray. 2They will put you out of the synagogue; in fact, a time is coming when anyone who kills you will think he is offering a service to God. 3They will do such things because they have not known the Father or me. 4I have told you this, so that when the time comes you will remember that I warned you. I did not tell you this at first because I was with you. 5“Now I am going to him who sent me, yet none of you asks me, ‘Where are you going?’ 6Because I have said these things, you are filled with grief. 7But I tell you the truth: It is for your good that I am going away. Unless I go away, the Counselor will not come to you; but if I go, I will send him to you. 8When he comes, he will convict the world of guilta in regard to sin and righteousness and judgment: 9in regard to sin, because men do not believe in me; 10in regard to righteousness, because I am going to the Father, where you can see me no longer; 11and in regard to judgment, because the prince of this world now stands condemned. 12“I have much more to say to you, more than you can now bear. 13But when he, the Spirit of truth, comes, he will guide you into all truth. He will not speak on his own; he will speak only what he hears, and he will tell you what is yet to come. 14He will bring glory to me by taking from what is mine and making it known to you. 15All that belongs to the Father is mine. That is why I said the Spirit will take from what is mine and make it known to you. 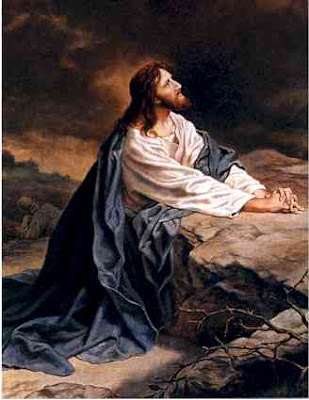 Matthew 26:36-46 Then Jesus went with his disciples to a place called Gethsemane, and he said to them, “Sit here while I go over there and pray.” 37 He took Peter and the two sons of Zebedee along with him, and he began to be sorrowful and troubled. 38 Then he said to them, “My soul is overwhelmed with sorrow to the point of death. Stay here and keep watch with me.” 39 Going a little farther, he fell with his f ace to the ground and prayed, “My Father, if it is possible, may this cup be taken from me. Yet not as I will, but as you will.” 40 Then he returned to his disciples and found them sleeping. “Could you men not keep watch with me for one hour?” he asked Peter. 41 “Watch and pray so that you will not fall into temptation. The spirit is willing, but the body is weak.” 42 He went away a second time and prayed, “My Father, if it is not possible for this cup to be taken away unless I drink it, may your will be done.” 43 When he came back, he again found them sleeping, because their eyes were heavy. 44 So he left them and went away once more and prayed the third time, saying the same thing. 45 Then he returned to the disciples and said to them, “Are you still sleeping and resting? Look, the hour is near, and the Son of Man is betrayed into the hands of sinners. 46 Rise, let us go! Here comes my betrayer! GEORGE WASHINGTON PRAYING FOR “THIS NATION”. PS. 122:6 Pray for the peace of Jerusalem: “May those who love you be secure. We are mandated to Pray for the Peace of Israel!!! 11:1 So I ask, God has not rejected his people, has he? Absolutely not! For I too am an Israelite, a descendant of Abraham, from the tribe of Benjamin. 11:5 So in the same way at the present time there is a remnant chosen by grace. 11:6 And if it is by grace, it is no longer by works, otherwise grace would no longer be grace. 11:11 I ask then, they did not stumble into an irrevocable fall, did they? Absolutely not! But by their transgression salvation has come to the Gentiles, to make Israel jealous. 11:12 Now if their transgression means riches for the world and their defeat means riches for the Gentiles, how much more will their full restoration bring? 11:13 Now I am speaking to you Gentiles. Seeing that I am an apostle to the Gentiles, I magnify my ministry, 11:14 if somehow I could provoke my people to jealousy and save some of them. 11:15 For if their rejection is the reconciliation of the world, what will their acceptance be but life from the dead? 11:16 If the first portion of the dough offered is holy, then the whole batch is holy, and if the root is holy, so too are the branches. 11:17 Now if some of the branches were broken off, and you, a wild olive shoot, were grafted in among them and participated in the richness of the olive root, 11:18 do not boast over the branches. But if you boast, remember that you do not support the root, but the root supports you. 11:19 Then you will say, “The branches were broken off so that I could be grafted in.” 11:20 Granted! They were broken off because of their unbelief, but you stand by faith. Do not be arrogant, but fear! 11:21 For if God did not spare the natural branches, perhaps he will not spare you. 11:22 Notice therefore the kindness and harshness of God—harshness toward those who have fallen, but God’s kindness toward you, provided you continue in his kindness; otherwise you also will be cut off. 11:23 And even they—if they do not continue in their unbelief—will be grafted in, for God is able to graft them in again. 11:24 For if you were cut off from what is by nature a wild olive tree, and grafted, contrary to nature, into a cultivated olive tree, how much more will these natural branches be grafted back into their own olive tree? “The Deliverer will come out of Zion; he will remove ungodliness from Jacob. 11:28 In regard to the gospel they are enemies for your sake, but in regard to election they are dearly loved for the sake of the fathers. 11:29 For the gifts and the call of God are irrevocable. 11:30 Just as you were formerly disobedient to God, but have now received mercy due to their disobedience, 11:31 so they too have now been disobedient in order that, by the mercy shown to you, they too may now receive mercy. 11:32 For God has consigned all people to disobedience so that he may show mercy to them all. 11:33 Oh, the depth of the riches and wisdom and knowledge of God! How unsearchable are his judgments and how fathomless his ways! 11:34 For who has known the mind of the Lord, or who has been his counselor? 11:35 Or who has first given to God, that God needs to repay him? 11:36 For from him and through him and to him are all things. To him be glory forever! Amen. Romans 11:31 Some manuscripts do not have now. “Wait, my dautghter.” “Be careful, keep calm and don’t be afraid. Do not lose Heart.” …”Be still, and know that I am God..”-“Did I not tell you that if you believed, you would see the glory of God?” – That the arrogance of man will be brought low and the pride of men humbled, the Lord alone will be exalted in that day. “Mary….sat at the Lord’s feet listening to what he said….”Mary has chosen what is better, and it will not be taken away from her.”-In repentance and rest is your salvation, in quietness and trust is your strength.”-When you are on your beds. Search your hearts and be silent. Be still before the Lord and wait patiently for him: do not fret when men succeed in their ways, when they carry out their wicked schemes…He will have no fear of bad news: his heart is steadfast, trusting in the Lord: His heart is secure – The one who trusts will never be dismayed.